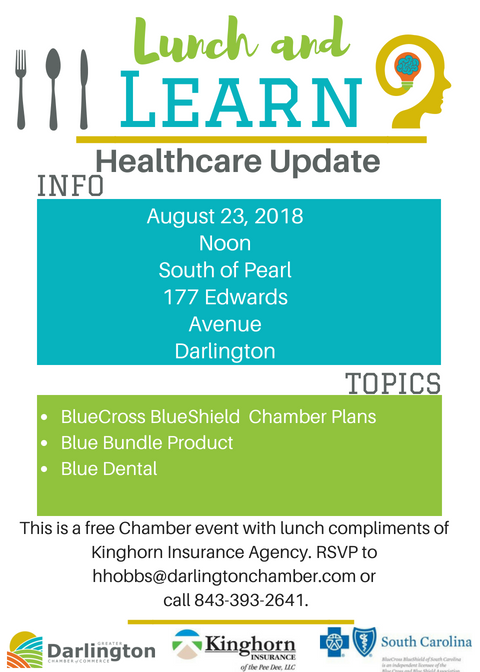 Join the Greater Darlington Chamber of Commerce for a Lunch and Learn, sponsored by Kinghorn Insurance Agency, about Healthcare Updates at South of Pearl on August 23. This Lunch and Learn will cover BlueCross BlueShield Chamber plans for 2019, BlueBundle Product, BlueDental, and how you can benefit from them all! This Lunch and Learn is FREE to Chamber members and includes lunch at South of Pearl, compliments of Kinghorn Insurance Agency. Space is limited, so please RSVP by contacting the Chamber at 843-393-2641 or by email to hhobbs@darlingtonchamber.com. Don’t miss this informative Lunch and Learn!